What causes ideological conversions? Why do intellectuals who hold strong political and philosophical beliefs for many years change their minds and adopt very different, sometimes opposite, beliefs? 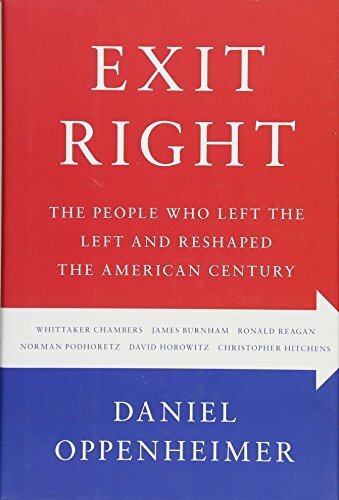 These are the questions that Daniel Oppenheimer attempts to answer by examining the ideological journeys of Whittaker Chambers, James Burnham, Ronald Reagan, Norman Podhoretz, David Horowitz, and Christopher Hitchens in his new book Exit Right: The People Who Left the Left and Reshaped the American Century. Oppenheimer’s subjects cover the time period from the 1920s to the early 21st century. Five of them were writers. Reagan, of course, was a political leader. Three of them—Chambers, Burnham, and Horowitz—began as Marxists. Reagan and Podhoretz started their ideological journey as liberals. Hitchens, alone among the six, does not fit neatly into Oppenheimer’s ideological odyssey—he remained on the Left throughout his writing career. Chambers and Burnham were Marxist intellectuals and writers who journeyed from Left to Right during the 1930s, in the midst of Stalin’s Great Terror and the Nazi-Soviet Pact. Chambers was also an undercover courier who engaged in espionage with members of communist cells who infiltrated the U.S. government in the 1930s, including, most famously, Alger Hiss. Reagan was a Hollywood actor and New Deal liberal who gradually shifted to conservatism in the late 1940s and early 1950s as his acting career waned. Podhoretz and Horowitz moved from Left to Right in the aftermath of the tumultuous 1960s and America’s defeat in the Vietnam War. Hitchens broke with the Left only with regard to America’s war against Islamic terrorists in the wake of Al Qaeda’s attacks on September 11, 2001, and the subsequent war in Iraq. Oppenheimer to varying degrees sympathizes with his subjects because none of these journeys was easy. Chambers’ break with communism exposed him to possible assassination by the NKVD (People's Commissariat for Internal Affairs), and when he identified Alger Hiss and others in government as Soviet agents the response was character assassination, ridicule, and worse. Burnham’s exit from the Left—first from the Trotskyists, then later from the Partisan Review crowd—cut him off from the “respectable” New York intellectual community. Podhoretz, Horowitz, and Hitchens alienated close friends and former comrades from past ideological battles when they moved rightward. Reagan’s journey was more gradual, less confrontational, and thereby less psychologically difficult than the others. All but Hitchens found a new identity on the other side that was coherent and functional, but unfortunately Oppenheimer skips most of those details. Chambers wrote Witness, wrote briefly for National Review, and became a conservative icon whose writings influenced a generation of conservatives, including Ronald Reagan. Burnham wrote an influential Cold War trilogy and other important books, and became a founding editor of National Review where his regular column on the Cold War appeared for 23 years. Podhoretz, the longtime editor of Commentary, became perhaps the most influential member of the neoconservative movement that blossomed in the late 1970s and early 1980s, and significantly impacted U.S. foreign policy in the Reagan and George W. Bush administrations. Horowitz publicly repented his communist past, heaped scorn upon his erstwhile allies on the far Left, targeted the academic community for its political correctness and hostility to conservative points of view, and waged (and continues to wage) ideological war against Islamists. Reagan eventually became the political leader of the conservative movement and as President did more than any of the others to reshape the American century. Hitchens, unlike the others, according to Oppenheimer, “wasn’t the typical turncoat.” The others moved to the Right “in search of God” (Chambers), as “refugees from communism” (Chambers, Burnham, and Horowitz), because they were “betrayed by the Left” (Podhoretz and Horowitz), “alienated from popular culture” (Podhoretz), or became a “passive receptacle for” popular culture (Reagan). “Hitchens,” writes Oppenheimer, “was none of these types.” He refused to be bound by “blood, nation, family, party, or ideology but only by what he perceived to be just and true.” On the journey rightward, therefore, only Hitchens remained pure. And yet of the six men studied in the book, Hitchens had the least impact on reshaping the American century. He will likely be the least remembered by posterity. Oppenheimer is certainly right that multiple factors—personal, political, and ideological—shaped the intellectual journeys of Chambers, Burnham, Podhoretz, Horowitz, Reagan, and Hitchens. But for the most part, these men changed their ideological and philosophical positions and attitudes in reaction to events—Stalinism and the Nazi-Soviet Pact, the excesses of the New Deal, the changes in popular culture in the 1960s, America’s defeat in the war in Southeast Asia, and the Islamist threat at the dawn of the 21st century.